Sign up to receive our sneak peeks, beauty tips, and exclusive online offers & promotions. Create a rewards account today and receive 25 starter points! Natural Organic Age Defying Skin Care Products,Natural Organic Makeup,Natural Organic Personal Care Products, No Parabens or Toxic Chemicals, Gluten Free. Vegan,Made in the USA. Best Quality at affordable prices. NO Animal Testing. STEP: 1 (Cleanse) Natural Organic Infused Vitamin C Foaming Cleanser (Normal, Combination Skin)- 6 oz. (Exfoliate) 2-3 times per week Organic Infused Exfoliant with Blueberry, Cranberry & Pomegranate - 2 oz. (Mask) 1-2 times per week Beet Mask - 2 oz. If you want us to write a note on the gift card - please write the exact words in the comments section at checkout. This toner won't dry your skin like alcohol based toners. This toner is moisturizing and toning, rich in Vitamin C, DMAE and essential oils that benefit your skin. Rich in vitamins and minerals that give your skin extra antioxidants to fight the damage that free radicals deliver to your skin on a daily basis. Contains antioxidants to fight the damage caused by free radicals every day to your skin. This step closes the pores, adjusts the pH of the skin and prepares your skin to receive moisture while removing any remaining oil or dirt from the skin.PARABEN FREE. 95% Organic Content. Alcohol Free. Why use a toner? I think I hear, “why do I need to use a toner”, more than any other question. People often underestimate the value of a toner because toners are a mystery to most people. Aside from relieving your skin of further makeup and cellular debris, toners give our skin a pH balance. Our skin should stay between 5 and 6 pH. After cleansing, the pH balance gets disturbed and when this happens it has to work harder to regain its’ balance, which can also mean it will produce more oil. Using a toner helps to restore the balance quickly. Another side benefit of using a toner is to get the hard water residue off of the skin. That white streak that you see on the side of a freshly washed glass that has just been rinsed is chlorine and hard minerals. These hard minerals are left on your skin after you rinse off the cleanser products. These minerals can dry your skin. Removing oil with toner gives the skin an appearance of smaller pores and smaller pores makes skin look smoother and more youthful. Toners can help close pores and tighten cell gaps after cleansing. This reduces the penetration of impurities and environmental contaminants into the skin. JES Organics toners have humectant qualities, which mean that they help to bind moisture to the skin. Our toners also have fruit extracts that exfoliate the skin of dead cells and moisturizing properties. We recommend that if you don’t want to wash your face in the morning, use a toner to get the oil or dirt off of your skin. Your skin will feel fresh, softened and revitalized. STEP: 5 (Moisturize) Super Vitamin C Moisturizer with Antioxidants. This is a lighter moisturizer than our creme moisturizer. Prefered by some of our younger clients or during hot humid weather. Concentrated synergistic blend of anti-oxidants & nutrients work together to provide your skin with moisture, minimizing fine lines while leaving your skin velvety smooth. 6 oz. pump bottle. Skin Types: All. Recommended for younger skin types or those that live in hot humid climates. Mature or dry skin types may prefer our creme moisturizer. Cleanser Directions: Cleanse your face & neck morning & night. For best results, apply to dry skin, massage in circular motions in an upward direction. Rinse off in the shower or with a wet washcloth. Follow with JES toner & the complete skin care regime. Exfoliant Directions: Exfoliate your face and neck every three days. Always exfoliate in circular motions in an upward direction. Be gentle with your skin; you do not need heavy pressure to cleanse. You don't need to use anything but your hands; washcloths are optional. Toner Directions: With mouth and eyes closed, spray mist over face, neck and upper chest. Avoid eyes and mouth. Follow with JES Organics complete Ageless Skin Care Regime. Moisturizer Directions: Apply to face, neck & upper chest. For best results, use as part of the complete JES Organics Ageless Skin Care Regime. Cleanser Ingredients: Organic Aloe Vera, Organic Gotu Kola, Organic Horsetail, Organic Geranium, Organic Dandelion, Organic Aloe Vera Juice, Decyl Glucoside, Cocamidopropyl Hydroxysultaine, Cocamidopropyl Betaine (from coconuts), Cocamide MIPA, Sodium Ascorbyl Phosphate (Vitamin C), MSM, Disodium Laureth Sulfosuccinate, Disodium Lauryl Sulfosuccinate, Carbomer, (2s)-2-Amino-5-guanidinopentanoic Acid, Olive Oil, Organic Rose Hip Oil, Borage Oil, Orange Peel Tincture, Oregano Oil, Tea Tree Oil, Phenoxyethanol, Ethyl Hexyl Glycerin, Essential Oils of Sweet Orange, Pink Grapefruit, Lemon, Lime, Litsea, & Mandarin. Moisturizer Ingredients: Organic Aloe Vera, Organic Gotu Kola, Organic Horsetail, Organic Geranium, Organic Dandelion, Organic Aloe Vera, Palm Oil, MSM, Sodium Ascorbyl Phosphate (Vitamin C), Kosher Vegetable Glycerin, Cetyl Alcohol, Stearic Acid, Glyceryl Stearate, Organic Safflower Oil, Shea Butter, Organic Jojoba Oil, Vitamin B5, Phenoxyethanol, Ethylhexyl Glycerin, Xanthan Gum, Organic Green Tea, Citric Acid. 15% Vitamin C.
(Organic Bilberry Extract, Organic Sugar Cane Extract, Organic Sugar Maple Extract, Organic Orange Fruit Extract, Organic Lemon Extract, Organic Cranberry Extract) skin-conditioning agents, help promote younger looking skin and help to minimize the effect of aging. Help to exfoliate the skin of dead cells; they also have a moisturizing effect on the skin, by increasing the moisture content of the upper skin and so smoothing out fine lines and wrinkles, as well as reducing dryness and combating flakiness. Long-term use of low concentration AHA's can also increase collagen and elastin synthesis, and also boost protein regeneration in the skin. We use Organic Aloe Vera Juice as our first ingredient instead of water. Often called “The Miracle Plant”, promotes new skin growth, moisturizes, protects and counters the effects of aging, soothing, emollient, anti-bacterial, heals skin irritations, burns and wounds. Aloe Vera improves hydration and is soothing and healing to all skin types. The effectiveness of Aloe Vera gel as a cosmetic skin care and pharmaceutical product is indisputable. It has also been shown to have an invigorating effect on skin when applied on a regular basis. Chemical analysis has shown the presence of mucopolysacharides, a natural moisturizing factor. Aloe Vera is composed of water, the enzymes catalase and cellulose, minerals, calcium, aluminum, iron, zinc, magnesium, sodium, 20 amino acids and carbohydrates. Aloe Vera also contains the "youth mineral" potassium. One of the most rejuvenating and regenerating oils that can be used in skincare and helps to improve the complexion, as it helps to remove toxic build-up in the skin and eliminates excess water from the tissue. An intriguing finding in some DMAE studies was that it reduced the accumulation of lipofuscin deposits inside cells. Lipofuscin deposits are cellular pigment consisting of aggregated chucks of molecular waste. It has been demonstrated that DMAE causes some degree of skin and pore tightening. However, it remains unclear how DMAE firms the skin -- whether by stabilizing the membranes, boosting acetylcholine, reducing lipofuscin deposits or none of the above. Whatever the mechanism, the effect of DMAE is often noticeable although seldom dramatic. Besides, even though DMAE can't fully reverse the existing facial sag, it may reduce its further progression. People report a cumulative effect with continued use of DMAE. Naturally occurring substance that facilitates the synthesis of a neurotransmitter acetylcholine. Acetylcholine is a compound released from the ends of nerve fibers and it is involved in the transmission of nerve impulses. DMAE also may stimulate the synthesis of phosphatidylcholine, an important component of cell membranes. Phosphatidylcholine is an essential fatty acid that improves and protects cell membranes damaged by free-radicals and improves blood flow and circulation. Vegetable Glycerin is obtained by adding alkalies to fats and fixed oils. Glycerin is a soothing, humectant which draws moisture from the air to the skin. Glycerin is an emollient, which makes the skin feel softer and smoother, reduce rough feeling, cracking and irritation. Glycerin has a high hydrophilic (water) factor and a low lipophilic (fat) factor. Nontoxic, nonirritating and non allergenic. Green tea is well known for its antioxidant properties, which prevents the degradation of cell membranes by neutralizing the spread of free radicals. Green tea has 20 times the antioxidant properties of Vitamin E, 6 times the antioxidant effectiveness of black tea. Green tea suppresses inflammation and reduces irritation. Scientists at the University Hospitals of Cleveland (UHC) and Case Western Reserve University (CWRU) found that ingredients in green tea decreased the direct effects of sunburn. Wonderful natural moisturizer similar to human sebum so it is accepted very well by the skin. It aids in the healing process. The skin is the body's largest organ. The structure of the skin is held together by collagen. MSM helps to replenish and repair damaged skin and wound healing. Great skin moisturizer, contains linoleic acid which prevents water from evaporating. According to Leslie Baumann, M.D., author of The Skin Type Solution, olive oil can promote healthy skin and also contains at least four different antioxidants, which can help "neutralize damaging free radicals that can lead to skin aging and skin cancer." Naturally derived from palm oil. Helps to bind and thicken creams. Recommended for wide range of ailments including skin problems such as eczema, diaper rash and acne because applied topically it has a soothing effect on the skin. Rooibos tea is low in tannins, high in minerals such as calcium and fluoride. The most important aspects of Rooibos are its antioxidant, anti-inflammatory and antimicrobial properties. Recently, Japanese scientists found that Rooibos tea contains a mimic of the enzyme Super Oxide Dismutase (S.O.D. ), an antioxidant which attacks the free radicals and limits their damaging effects. Shea butter is a particularly effective moisturizer because contains so many fatty acids, which are needed to retain skin moisture and elasticity. The high fatty acid content of Shea butter also makes it an excellent additive to soap, shampoos, anti-aging creams, cosmetics, lotions, and massage oils—its soft, butter-like texture melts readily into the skin. African healers have used Shea butter for thousands of years as the ideal treatment for dry or aging skin. Its high content of non-saponifiable fatty acids gives it the ability to moisturize and retain the elasticity of the skin. Shea butter also protects the skin against the damaging effects of the sun while repairing cellular degeneration. Shea butter protects the skin from both environmental and free-radical damage. It contains vitamins A and E, and has demonstrated both antimicrobial and anti-inflammatory properties. Has been used to help heal burns, sores, scars, dermatitis, psoriasis, dandruff, and stretch marks. It may also help diminish wrinkles by moisturizing the skin, promoting cell renewal, and increasing circulation. Shea butter also contains cinnamic acid, a substance that helps protect the skin from harmful UV rays. Natural skin protector, natural emollient, helps keep skin smooth and soft, improves skin moisture by offsetting dryness caused by aging and environmental factors. Acts as a free radical scavenger, hinders the oxidizing process in the skin and promotes soft and supple skin. As an antioxidant it defends the skin. Helpful in reducing scars and promotes healing. It acts as a natural preservative for products. Xanthan gum is a polysaccharide (natural sugar) used to thicken products. Eye Crème with Hyaluronic Acid .75 oz./22ml. A gentle and rich crème that contains active ingredients like hyaluronic acid, lavender, blue green algae, calendula, rooibos, pomegranate extracts and evening primrose that work synergistically to soothe, balance, regenerate, supply and retain moisture in the tender and delicate skin around your eyes. Organically Preserved. PARABEN & FRAGRANCE FREE. Directions: With clean hands, apply small dots of eye crème with your ring finger around the bony area surrounding the eyes. Gently pat the dots until the crème is absorbed. Eye Cream Ingredients: Organic Aloe Juice, Organic Olive Oil, Organic Jojoba Oil, Lavandula x intermedia ‘super’ (Organic Lavender) Extract, Emulsifying Wax, Palm Stearic Acid, Organic Rooibos Tea Extract, Evening Primrose Oil, Vitamin E, Organic Pomegranate Extract, Hyaluronic Acid, Organic Calendula Officinalis Extract, Organic Blue Green Algae Extract, Xanthan Gum, Citric Acid. Often called “The Miracle Plant”, promotes new skin growth, moisturizes, protects and counters the effects of aging, soothing, emollient, anti-bacterial, heals skin irritations, burns and wounds. Aloe Vera improves hydration and is soothing and healing to all skin types. The effectiveness of Aloe Vera gel as a cosmetic skin care and pharmaceutical product is indisputable. It has also been shown to have an invigorating effect on skin when applied on a regular basis. Chemical analysis has shown the presence of mucopolysacharides, a natural moisturizing factor. Aloe Vera is composed of water, the enzymes catalase and cellulose, minerals, calcium, aluminum, iron, zinc, magnesium, sodium, 20 amino acids and carbohydrates. Aloe Vera also contains the "youth mineral" potassium. A kosher certified fine free flowing dark blue green powder. Free of pesticides, synthetic dyes and preservatives. Blue Green Algae is a wild harvest organic certified single cell microscopic organism which occurs in the remote area in the Oregon Cascade Mountains. It is highly bio-available and contains a full spectrum of minerals, chlorophyll, B Vitamins, Beta-Carotene, Pro Vitamin A, Lipids, active enzymes, essential amino acids, nucleic acids, DHA and EPA fatty acids. Best known for its wound-healing and anti-inflammatory properties, antimicrobial. anti aging properties, helps to reduce and lessen the signs of aging decreases fine lines and wrinkles, helps to smooth rough skin, aids in repairing the skin and helps skin elasticity. One of the most exciting ingredients on the market today. Discovered by Karl Meyer in 1934 and has been successfully used in personal care and wound healing. Until the 1990’s the only method of producing hyaluronic acid was extracting it from rooster combs. Currently there are two forms of hyaluronic acid on the market; one from rooster combs and the other by fermentation in the lab. 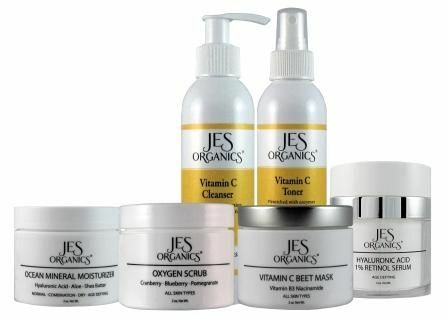 JES Organics only carries the vegan approved lab created version. Hyaluronic acid is naturally found in the extracellular matrix of human tissue. Topically applied hyaluronic acid forms an air permeable layer and penetrates into the dermis, thus boosting the elasticity and hydration of the skin. The protective breathable barrier on the skin locks in moisture which gives the skin a youthful appearance. The cuticular layer of the skin normally contains 10-20% water, however as we age it can drop to below 10%. Hyaluronic acid comes to the rescue with its unique ability to hold more than 1000 ml of water per gram of hyaluronic acid, which is a key factor in allowing the skin to retain more water. Amazingly, hyaluronic acid adjusts its moisture absorption based on the relative humidity in the air. It is the ideal ingredient in skin care products as it adjusts to the skin’s need for a moisturizing effect depending on the relative humidity of seasons and climate of an area. Hyaluronic acid also protects the epidermis by scavenging reactive oxygen species generated by ultra violet light which would normally cause sunspots. considered one of the best plants of the lavandins, maintaining most of the same properties of the mother plant, true lavender. It has good antibacterial, antifungal, anti-inflammatory and antiviral properties. Used as a preservative and antioxidant to prevent rancidity. Vitamin C is thought to prevent collagen break down and help combat the signs of aging. As an antioxidant it is believed to remove the free radicals that cells produce. Free radicals have been associated with skin cancer and premature skin aging due to sun exposure. Some experts believe antioxidants are the most vital weapons in the fight against aging. Most of the damage of our skin is caused by a free-radical assault from smoke, pollution and UV rays. Free radicals then turn the oils of our skin rancid, which damages the collagen. Collagen is the protein fibers that serve as the building blocks of our skin. Antioxidants are used in skin care products to neutralize free radicals before they ravage the skin. Topical vitamin C may help lighten solar lentigos and melasma. Some studies have shown that topical vitamin C provides additional protection against the harmful effects of the sun. Said to prevent collagen breakdown, which would aid in combating aging. Duke University found that adding Vitamin C and E to sunscreens protects against UVB radiation. Anti-inflammatory, Black Willowbark has antiseptic, astringent properties and has been shown to possess potent anti-microbial properties. Willow bark extract has several benefits in skin care but can help to stimulate the skin and cell growth and also has excellent astringent qualities. Copyright © JES Organics 2018 All Rights Reserved.